My mom gave me this blanket about 4 months ago and from day one I have been obsessed. I heard a lot of good things about the blanket and how it has a lot of mental health benefits to it. I did some research and found these things that I would like to share with you guys!. This is not a sponsored post or anything. 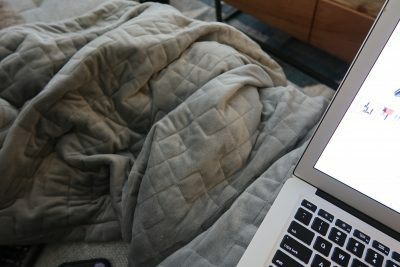 I just really love this blanket and since it is the beginning of cozy season, if you are like me, the more blankets the better! And what is better than a blanket that not only keeps you warm and cuddly but also has other mental health benefits as well! Weighted blankets are made to be 7-12% of your body weight to relax the nervous system through making the body feel like it is being held or hugged. I mean how cool is that!!? I know I use this blanket the most when Damion is on a road trip or something. I can tell when there is a weight missing from the other side of the bed so having the weight on me from the blanket makes his presence feel less absent. The weighted blanket is also said to increase serotonin and melatonin levels and decrease cortisol levels. By doing that, it can improve your mood and help you sleep better and have restful nights. For me, sometimes I take melatonin pills to help me sleep at night because my mind never stops. I am always stressing over what needs to be done or what I have on my ever going to-do lists. But when I use the blanket I find that I do not need the pills to help me sleep so I save money by not having to buy pills all the time. I just cuddle up with this blanket at night and it helps me sleep! Even if I am just relaxing on the couch, it calms me down and allows me to just relax when necessary. I am a huge believer and taking care of your mind and body and I think that at least once during the work day, your mind needs to take a break. 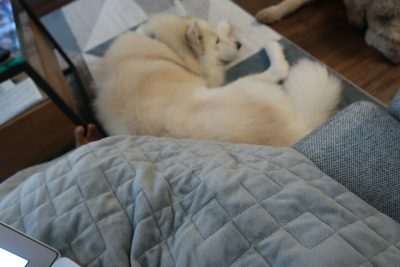 When my heads is going a thousand miles an hour during the day, it is sometimes hard or me to just stop but I found that the blanket really helps me with that! 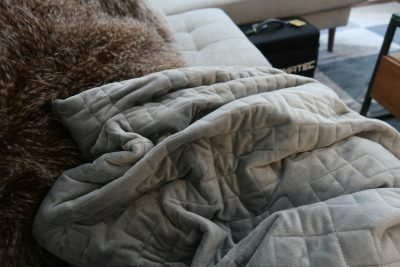 There are multiple places you can get weighted blanket and multiple brands but my mom bought mine from GravityBlankets.com. If you get it, I hope you all enjoy it! Don’t forget to reach out! I love hearing from you guys! Hi!! I find that it is more on the warmer side but my husband likes to sleep with the air on on like 50 so it brings that warmth to me. I don’t find that I am throwing it off a lot. so it all depends on how you prefer the temperature to be when you sleep. It feels nice with a fan as well! I have the same problem winding down at night and routinely fall asleep around midnight as a result. I will definitely try this blanket. A heartfelt thank you for sharing! This is awesome. Thanks so much for this review. I’ve been wanting this blanket for SO long but had a hard time committing to buying it because the price…but now I know it’s actually worth it – so I’ll definitely buy it! Hi there. I’m in Wesley Chapel, NC and was curious to know if you have the 15, 20, or 25lb blanket? Hi! I believe I have the 20 lbs one!